I was following in Bourdain’s footsteps when I dragged my friend down Avenida de Mayo at 2 a.m. after a few too many Presidente’s in a colmado nearby. It was that time of the night, that moment in which all I wanted was a warm, crunchy, gooey, salty thing breathing hot steam into my palms. This was not the time for dainty delicacies, for fresh seafood, for fresh anything, really. I wanted a sandwich, a brawny and substantial thing wrapped in crinkly wax paper, a plump and layered baby that would bleed its warm grease and mayo down my arms as I indulged in the artistry of its conception. 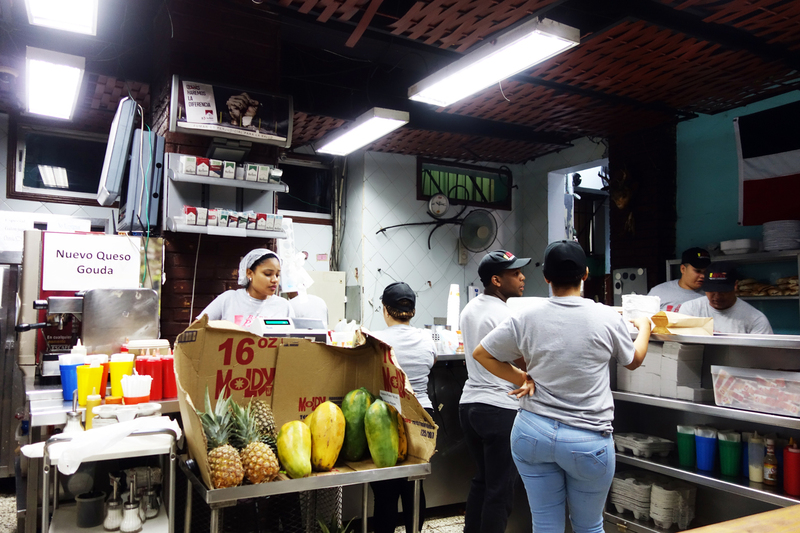 I had been told where to get just that: a 24-hour fast-food joint named Barra Payan, located in the neighborhood that flanks Zona Colonial to the north. This is the spot. It’s clearly the place to be. Packed at all hours with happy, hungry regulars there to get theirs, the good stuff. It’s that neighborhood diner from your childhood. You know, that spot slingin’ your favorites late into the night. Breakfast all day, grilled cheese, burgers, pancakes, milkshakes. For the Bostonian in me that’s the South Street Diner, a beloved institution the very mention of which makes my heart melt with fond memories of nights out with friends. I’m sure it does the same for folks from Santo Domingo, having served as that sacred place for several generations since it first opened in 1956. The menu is kept simple: sandwiches and juice. The list of ingredients is short but they’re combined in many permutations. There’s meat (pork, ham, chicken, salami), there’s veg (tom’s, o’s, lettuce) there’s cheese (Danish or Cheddar) and there’s egg or no egg. Prices hover between RD$75 (USD$1.60) for a grilled cheese to RD$160 (USD$3.50) for a meatier guy. They churn out an impressive 2,000 sandwiches a day. There’s no beer or liquor but, indeed, even a fully stacked bar could not compete with the crazy variety of juices available. Juices and shakes can be ordered in any combination of papaya, orange, grapefruit, pineapple, sapodilla (I don’t even know what sapodilla is), passion fruit, melon, cherry, strawberry, banana, prune, mango, lulo, loquat, jagua (again, what the heck are lulo, loquat and jagua? ), tamarind, soursop and guayaba. Order by the cup or by the gallon to take home for the week. Get them plain, with whole milk or “con C” (“C” for Carnation brand evaporated milk). 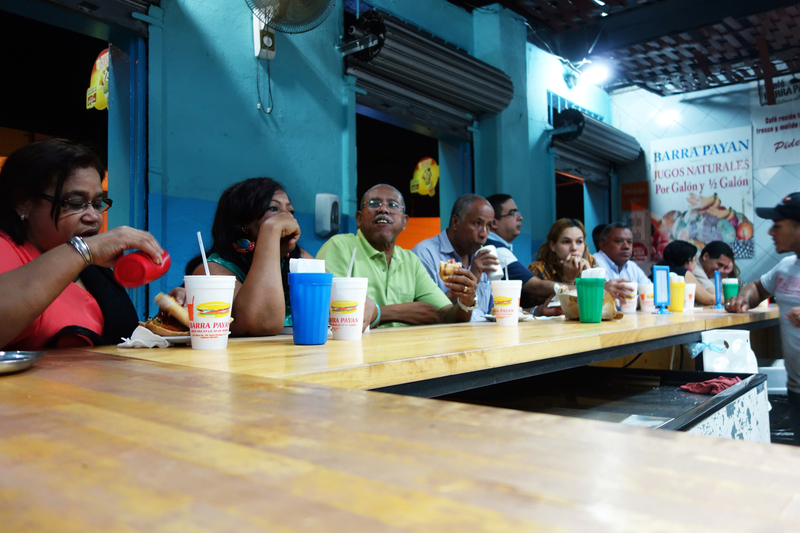 I personally went for the morir sonando (“die dreaming”), which is a frothy concoction of orange juice (nicknamed chirola) and Carnation shaken up with ice and poured back and forth until it gains volume in air. It’s like a liquid orange creamsickle, sticky sweet from the C with a far-off hint of orange flavor lingering in the background. For milkshake enthusiasts this is a must-try. For the lactophobic I would recommend sticking to a dairy-free blend of papaya, mango and passion fruit. 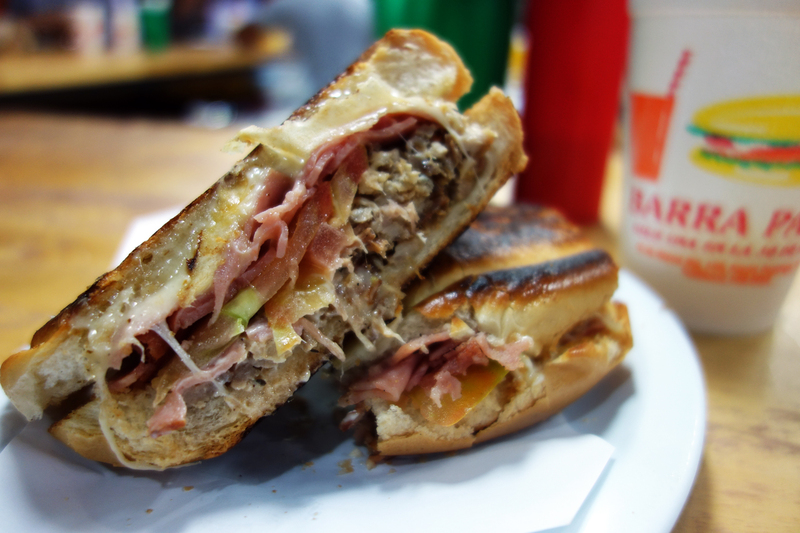 Numero uno on the sandwich list is the Payan Especial, their top selling hit. It’s composed of succulent pork leg, slices of ham, Danish and Cheddar cheese, tomato, mustard and mayo stuffed between two slices of airy, light bread that is toasted flat on both sides to achieve a sensational crunch. As the ingredients warm through from the toast the flavors melt together. The gooey cheese glues the tender pork to the slippery sheets of ham, holding them close for each bite. The roasted leg meat is moist and juicy, clearly shredded fresh that day with plenty of attention paid to seasoning and texture. The pork goes perfectly with the salty ham, a combination that has earned its fame through the better known Cubano sandwich. Mustard and mayo appear in perfect proportion, adding pockets of tang and creamy smoothness here and there without overwhelming the meat. That initial crunch is followed by steaming hot, moist ingredients flooding the mouth with their various textures and flavors. Each bite is heaven, savory and substantial. I witnessed many a satisfied face around me, eyes closing and throat humming with each delicious mouthful. 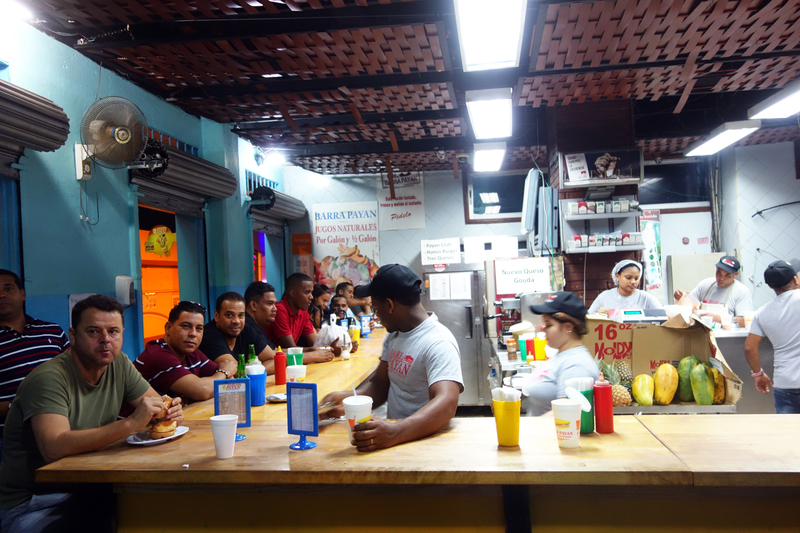 A laid back, comfortable and judgement-free establishment Barra Payan is the perfect place to crash at any time of day or night. 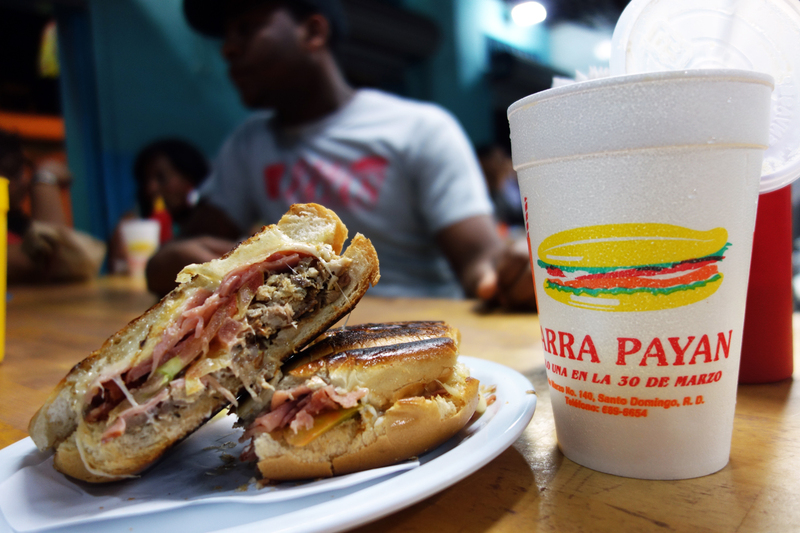 For its mouthwateringly melty sandwiches and its fresh fruit juices, it’ll be the first place in Santo Domingo I’ll recommend to anyone visiting the DR.
March 25, 2016 in DOMINICAN REPUBLIC.